Sometimes, more than one type of solar energy is installed, for instance, photovoltaic and eolic, because the weather conditions make it more advantageous. Functionality of a Wind and solar power facility is identical to the photovoltaic ones. The only difference is that a wind mill is added to the installation, together with a regulator, that transforms DC electricty produced by aerogenerator in AC to elevate potencial of solar panels. • is not renewable. The peak oil is near, as it announces the International Energy Agency. For this reason, an option increasingly extends into rural areas is the use of renewable energy to generate electricity. • cheap: after an initial investment to purchase the equipment for installation, the fuel is free, since it provides the same nature. USA is a territory particularly advantageous for the use of photovoltaic solar energy, given the amount of solar radiation we receive throughout the year. In some places, especially in the mountains, it is advisable to make a hybrid installation, ie it also includes a wind turbine to supplement the production of electricity, since weather conditions that produce both energies are complementary. In addition both systems enjoy the opportunity to receive grants to install. 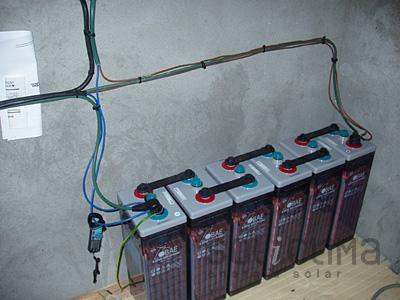 Also included are, a solar regulator, 6 batteries of 680 A, a 1500 W inverter and a 20 A regulator. The installed power is 125 Wp photovoltaic and 400 Wp eolic, for an average consumption of 1.2 kWh/day. It also has an inverter that converts direct current into alternating current, suitable for the use of appliances. To enhance the performance of the installation, stationary batteries are used. They are less economic than block (car type) bateries, but, more durable and efficient. When we talk about eolic energy, we tend to think of the great parks of companies such as Iberdrola and Acciona, but, wind power can also be used in small domestic installations, if the wind has a minimum strenght in that area. In fact, when a rural home or business needs electricity, combining solar photovoltaic and wind power is the best option, because, the weather conditions that produce them, complement each other.